Returning to modeling in the upcoming issue of Numéro Tokyo, 36-year-old Dutch blonde bombshell Esther de Jong is featured in an editorial entitled “Ma Vie En Pink” or “My Life in Pink” shot by photographer Matthias Vriens-McGrath. Stylist Jason Farrer dressed Esther in whimsy designs by the likes of Viktor & Rolf, John Galliano, and Louis Vuitton in a colorful and patterned country home. 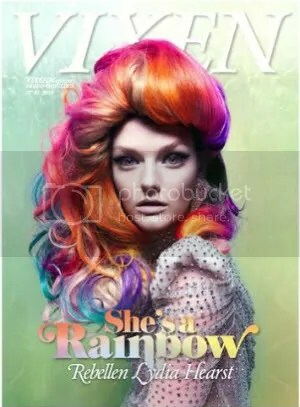 Featured on the cover of this spring’s issue of Vixen, 25-year-old blonde bombshell Lydia Hearst graces the issue in a colorful and surreal shoot. Shot by photographer Elias Wessel, stylist Storm Pedersen decorates Lydia in an abundant amount of gems, sequins, and greenery for a gorgeous shoot that I really enjoy.